But Tati, an Italian brand, makes many other wonderful products, too - here's just one. In the U.S., you can find Tati's furniture at GoziaHome. Warning: It's not cheap. Update on Jan. 17, 2010: Changed wording to call Tati a brand, not a company. Micuna, in Spain, offers a range of colorful choices. You might want to take a look at the company's environmental policies. 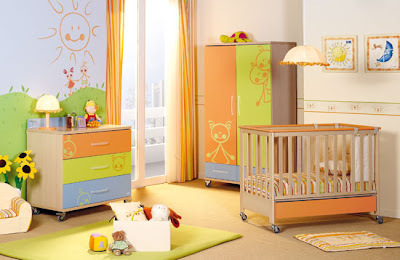 Gautier, based in France, has many colorful options, too. There's a full range of furniture, not just the small cupboards. 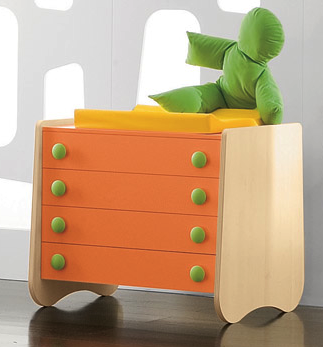 Miguel, in New York, offers this changing table in five different woods, and eight colors. There's a matching dresser. Finn & Hattie is the children's line from the always-colorful Maine Cottage. Update on Jan. 17, 2010: Finn & Hattie seems to have disappeared. 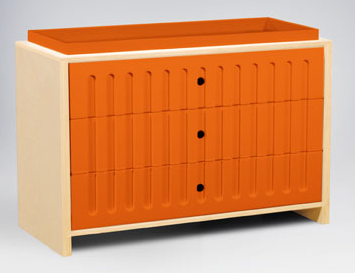 If you follow children's furniture, you probably already know about ducduc; that's ducduc's 3-drawer changer. 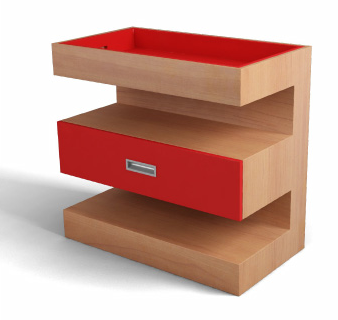 It's available in seven colors, and either a light wood (as shown) or white. Most of the lovely children's furniture from Pali is more restrained than this fanciful line, called Sole. (You can read Pali's environmental policies on-line, too.) Update on Jan. 17, 2010: The Sole line is no longer shown on the Pali web site. 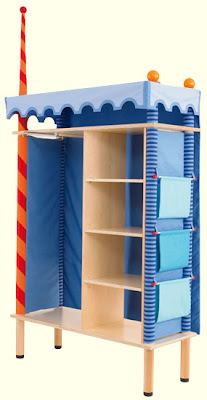 And finally, Haba, based in Germany, has a number of products - including this new knight wardrobe. 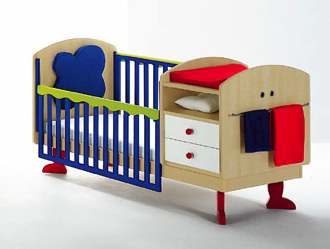 Haba products tend to be widely available; I'm not seeing this specific piece anywhere except the Haba web site, but I am finding the matching storage bench a number of places, including here and here. 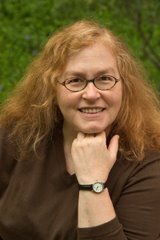 Update on Jan. 17, 2010: Both the wardrobe and the storage bench have been discontinued. Thanks for the post, those furnitures look nice!